» What Were the Faults of the Sub-Chasers? Subchaser.org Editor's note: This is a text scan of an article that appeared in a Dec. 1919 issue of Motor Boating magazine. I'm missing two pages of the original, but obtained copies from the G. W. Blunt White Library in Mystic, CT.
Navy 110-Footers which Lacked Nothing as U-Boat Fighters Fell Short of Perfection in Other Respects. How the Motor Boat Builder May Profit by Their Example. SEVERAL times in the last few months I have delivered myself of the opinion that the 110-foot motor boat known officially to the Navy as the submarine chaser is the most seaworthy hull that was ever designed. Once or twice I have been caught up with the criticism that this was rather a sweeping statement to make. And, considering my lack of personal experience with other types of hulls - with Roman galleys, Malayan proas, and ocean greyhounds, for example-I have been obliged to confine my statement to motor boats. If there should be anyone so captious as to call my attention to the self-righting motor boat of the lifesaver's model I shall have to fall back on the explanation that it was less my intention to state a scientific fact than to express my admiration for the S. C.'s. For the chasers are wonderful sea boats. They were selected for service in three of the roughest waters of Europe - the Adriatic, the Bay of Biscay, and the North Sea - and not one of the hundred-odd American-manned submarine chasers performing this arduous duty ever came off second best in a battle with the elements. This record, taken in conjunction with the fact that they crossed the Atlantic before commencing their work and then recrossed it long after that work was finished, substantiates my opinion that they are essentially seaworthy. After making this simple eulogium it is possible, however - and usual for anyone who has been in the chaser service to draw a long breath and say that they are the cussedest, uncomfortablest, most exasperating type of craft that ever, in the poet's phrase, felt the breath of life beneath their keels. I was talking the other day with an American naval aviation officer who had the unique experience of commanding a British dirigible only slightly smaller than the R-34, and who bore out the truth of my remarks. He told me that in the course of his training he had been required to familiarize himself with various types of water craft so that when co-operating with them from the air he could understand their problems and limitations. This training took him to sea on destroyers, submarines, and subchasers, and he had different experiences on each. The most harrowing was in a submarine when, proceeding submerged, a sunken buoy or defective mine bumped against her bow, and rattled along the side all the way to her stern. Previous combats with bosche aviators and subsequent attention from enemy anti-aircraft batteries furnished no mental anguish like that of waiting for this bumping, clangorous object to explode, and my friend told me that for the few seconds that it took to make the passage of the submarine's hull, every man in the crew, himself included, was frozen in an attitude of agonized suspense. Coming to the surface immediately to relieve the tension, the sub was bombed by a friendly balloon, and submerged precipitately to make its way to port. His next experience was on a Plymouth chaser, and out of a short but tumultuous two days at sea he was sick a long forty-eight hours. As a result of his association with practically all types of naval craft - air, surface and subsurface - my friend assured me that the subs were the worst branch of the service and that the chasers ran them a mighty close second. Personally, I am inclined to give worst place to the chasers on the ground that whereas submarines are not always being mined or bombed (which was evidently my friend's chief grievance against them) the chasers are incessantly tossed and rolled about by the waves. So my hearty admiration for the chasers is tempered by a realizing sense that they are uncomfortable. This was first demonstrated to us in the winter of 1917-18 when the temperature of the polar regions descended to New York and found the pioneers of the chaser force unprovided with heat of any sort except the doubtful emanations from oil stoves and electric radiators. Civilian workers at the Navy Yard took up our troubles in short order, however, and only five months after the chasers went into commission they were equipped with hot water heating systems of ample capacity to heat all compartments. That was in the latter part of March, and with the heating plants installed we were never again made uncomfortable by the cold, since we shoved off the next week for the warm regions of Bermuda and the Mediterranean. But the warmth of the summer latitudes struck us like the blast from an open furnace door, and we found that the chasers were difficult of ventilation. This lack of ventilating facilities was, I believe, the principal fault of the submarine chasers, and I regret that in mentioning it I am unable to make my criticism constructive by pointing out a remedy. I speak of it, however, in the hope that designers of subsequent motor craft, whether for naval or private use, will consider ventilation next to godliness. Any sailor can accustom himself to the instability of his craft and will condone insufficient headroom or cramped quarters when he knows that these are necessary to the safety of his vessel, but there has yet to arise a race of men who can live without fresh air or sleep peacefully in the fumes of gasoline engines. In harbor the lack of air was not so marked, because it was possible to open the ports and fit in them the wind scoops provided for the purpose of arresting every vagrant breath of air that might be stirring. But it was the chaser custom to moor to a wharf in clusters of five or six (or a dozen if no one called a halt) whence it followed that none but the outboard boat received more than half the benefit of natural ventilation. The quarters aft were particularly insufferable because of the heat which billowed forth from the galley long after the fire had been extinguished following the evening meal, but nobody objected strenuously to harbor conditions, because all who were not gifted with the physique of a salamander took their mattresses topside and slept in the open air. Under way, however, it was another matter. The port lights in the after quarters were a bare two feet above the waterline and in any kind of a sea were continuously immersed. Consequently, they were never opened, and in a following sea it was necessary also to dog down the ports in the deck house. Windsails for the after and the forecastle hatches might have been rigged but the frequent use of the companionways made them undesirable. I had the misfortune to be quartered in this compartment of a chaser for several months and I'm tempted to swear that the air it contained at the outset of a sea trip was imprisoned there until we returned to port. In the forecastle, conditions were even worse, for not only the ports but the hatch was dogged in a seaway, and for the admission of air there was only a deck ventilator, by necessity turned away from the wind. Here twelve men slept, ate, and spent their off watches for days on end, and I can say also from experience that the atmosphere was unspeakable. Only words which are barred from the pages of a magazine may be used to describe the breadth and variety of the forecastle odor. For artificial ventilation there was an electric blower (which discharged, strangely enough, into the chart house); but this was rarely used because it put too great a strain on the storage batteries or on the generator, which, even without it, was worked to capacity. 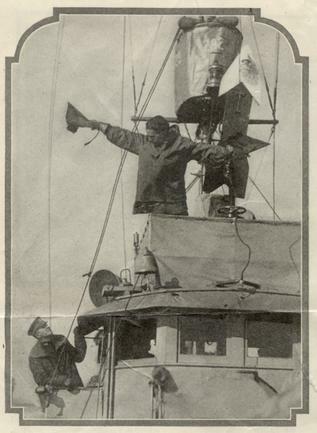 Persons who live ashore may think that the matter of furnishing fresh air for the enlisted man is not worth haggling over, but in the nautical understanding the lack of it meant sleepy lookouts and a general lowering of the crew's morale. I have observed time and again that in smooth weather when the engine-room ports and skylight could be left open to permit a free circulation of air for the machinist's mates on duty, the engines ran for hours without giving annoyance; and that on rough days with everything battened down tight trouble followed trouble with disheartening regularity. With the engine-room atmosphere so blue from the smoke of oil poured on hot bearings that the black gang couldn't see the engine they were working on (as was frequently the case), it was humanly impossible to keep the power plant at the peak of its efficiency. In this matter of ventilation I have reserved mention of the officers' quarters and radio room to the last, because underway conditions in them were the worst. On rough days we were given the alternative of death by suffocation or by drowning according to whether we cared to leave the ports closed or open. Generally, we chose the moister variety, and if we survived the cruise, dried our books, bedding and personal belongings to the best of the sun's ability. But when in a particularly heavy seaway suffocation seemed preferable, we closed the ports and took gas. Of this there are three known kinds, any of which is capable of sending a man to the mat for the count. The first was the raw gas vapor which came directly from the tanks via the vents which exhausted conveniently near the cabin ports, and entered the quarters whether or not the lights were open. On the S. C. 131 we minimized anesthesia from this source by capping the vents with lengths of rubber hose and leading them away from the ports. The second gas was similar to the first, but we could not properly identify or trace its origin. Its source was the bilges, although we could never find a leak in the fuel tanks beneath our quarters, and its strength was overpowering when, on entering or leaving port, we flushed the bilges with sea water. It was a smell different from and more sickening than raw gas and was certain to create headache and nausea in fifteen minutes. The third gas was compounded of burnt gasoline, oil, and rubber, and we considered it our specialty. The engine-room bulkhead, laid down in the specifications as WT, or water-tight, was anything but gas-proof, and when its junction with the frames of the hull had rusted somewhat the fumes filtered through despite our best efforts to stop them. In an effort to clear the air we installed a gooseneck ventilator in the roof of the radio cabin and transferred the blower from the forecastle to the cabin. But when it was learned that a back draft from the blower forced the gases into the forecastle we abandoned that method of ventilation and endeavored to inure ourselves to the fumes as the lesser of the several evils. Were I to build a motor cruiser for my personal use I should insist that the bulkheads be water and gas-tight in more than name. The engine-room would be completely isolated front the other compartments. There would be fans and blowers in each and an adequate electric system to provide the ventilation which, when under way, is so necessary and which in the chasers was so impossible of attainment. Only a little less annoying than the absence of air below decks was the presence of water which leaked in around the deck fittings and through the seams. It is a strange fact that, despite the haste with which the chasers were put together, a majority of them had dry hulls; and in view of this, it is stranger still that there was hardly a deck in the fleet that was impervious to water. I recall a night last spring when we were entering the Strait of Gibraltar from the east, bucking a head wind that kicked up a short and violent chop and deluged our forecastle deck with spray and solid water. In order to keep in formation we were going slightly too fast for comfort in the sea then running, but I was more than a little surprised midway of the watch to see the deck force advance by rushes from the forecastle hatch to the pilot house and to hear them explain that the timbers were weaving every time the vessel pounded. This was interesting if true, and, ordering the helmsman to hold her head off the wind while we dodged down the hatch, I took the boatswain's mate with me and went to listen to the weaving timbers. What I heard when we had passed the barrage of flying spray and were secure in the forecastle was an incessant dripping of water, and on looking around the I saw a deck shiny with moisture and transom cushions sodden with it. Each time we dipped our nose into a wave the water surged down the main deck, splashed against the hatch coaming and poured down the ventilator, and then as the wave receded a veritable cascade dribbled down the hawse pipe. This over-abundance of water impressed me with all the force of a novelty, for it was nearly a year since I had been in a chaser forecastle under way and I had forgotten the ubiquitous puddle of water in the middle of my bunk that used to greet me as I turned in at the close of a watch. But this life-sized imitation of the Cave of the Winds was typical of every submarine chaser, and no amount of calking or puttying could make the forecastle less aqueous. The weaving of the timbers, by the way was imaginary - either that or the sea had subsided in the thirty seconds it took me to go from the chart house to the crew's quarters. There was one feature of the design of this class of boat that ever was and always will be incomprehensible to me – the division: of the four fuel tanks into two separate units. The after, or main tanks, as they were called, filled from the bridge and fed from the engines. The forward or storage tanks were not con-nected with the main tanks, although they were only a few inches apart, and could not be emptied by gravity or vacuum feed. As I have not been taken into the confi-dence of the designer I can only surmise that this division was made to reduce the risk of fire. As a matter of fact, it in-creased the risk, since upon draining the main tanks we were obliged to uncover them and pump them full from the stor-age tanks – a laborious process at best, and one attended by other than fire risk when there was a high sea running. While pumping gas it was necessary to cover the engine-room ventilators and close all ports and hatches not already closed by stress of weather, throw the lighting switches and discontinue the radio watch. Sometimes while underway with a tanker on a long voyage we would barely finish transferring gas from the forward to the after tanks before being ordered alongside the tanker to refuel. So at the expenditure of two hours' time and a cer-tain wastage of gasoline we emptied our forward tanks only to refill them immediately. I should like to advise prospective motor boat builders to connect all their fuel tanks in series (equipping them with the requisite cut-off valves), no matter what argument may be put forward on the advantage of always having a reserve supply on hand. If an owner cannot remember to measure his tanks at stated intervals, he is entitled to hire an observer to look after this item and to see that he doesn't pour bilge water into his lubri-cating tank. The fire danger aboard the chasers was acute at all times and never more so than when an accumulation of water was al-lowed to collect in the bilges. Gasoline and oil drippings from the engines floated on the top of the water and there was needed only a backfire or a spark from a loose wire to ignite the vapor, and make the engine-room an inferno of flames. Be-sides three or four disastrous fires which were mentioned in the daily press there were many smaller ones that caused great anxiety before they were subdued. I re-member one explosion that lifted the roof of the engine house from its fastenings and sent two men to the sick bay for a period of weeks. In this instance the ex-plosion of the combustible mixture was not followed by a conflagration, but the attending circumstances stopped just short of tragedy. A wherry in the act of com-ing alongside the chaser capsized and two of its occupants who were unable to swim nearly drowned in the ensuing confusion. The chaser officers, both level headed men, were utterly bewildered for an appreci-able interval, and five minutes after the excitement had subsided one of the crew walked to the bow of the boat like a man in a trance and dived overboard. All hands on all the chasers had an ingrained dread of fire, and I know that many a heart-felt sigh of relief went up when the engines were rung down for the last time in the home yards. But in spite of the faults mentioned, the submarine chasers were a success, and it would serve no good purpose to dwell on further details of their shortcomings. Ventilation, water-tightness, and fire risk are not by any means new topics for dis-cussion, but the fact that in the chasers there was so much room for improvement along these lines would indicate that their importance has not yet been fully realized. When the perfect hull is evolved it will balance these essentials in nice ratio to speed, seaworthiness, convenience, and comfort – but it is to be doubted whether any two critics twill agree on the achieve-ment of the perfect hull. Marking according to the Navy scale of 4, wherein a grade of 2.5 is necessary for passing, I should rate the submarine chaser as follows: Ventilation, 2.4; tight-ness (bottom) 3.8; (decks) 2.3; speed, 3.2; convenience, 3.1; and seaworthiness, 4. No mark can be given under the head-ing comfort, for, as has been implied, it was nil; and the chaser was, moreover, a war vessel intended not for the pursuit of happiness but of submarines.